I enjoyed your editorial in the November issue. It “sparked” some very nice memories. I grew up in Philadelphia, and “Edmund Scientific” was almost local, across the river in NJ. My father bought a “crystal radio” kit from them for me, when I was about 7. No batteries, no speaker, just a pair of rudimentary headphones. I moved the “cat’s whisker” around on the crystal until I got the station I loved to listen to under the bed covers at night … WOR all the way from New York! That got me hooked on radio. By the time I was 15, I was the youngest Civil Defense radio operator in the metro area, and the only one who needed a “chauffeur” for mobile operations. Came time for military service and I was broadcasting from an AFRTS station in Eritrea. Returning to civilian life in Philly, I lucked out with a dream job at WIP Radio. Just another example of a drop of water starting a seed that becomes the mast on the Mayflower. Editor’s Note: I wish I’d thought about the crystal radio angle for my Editor’s Note. I made a tuner for mine with a coil of copper wire on a toilet paper tube, as I recall. Your note brought those memories back to me, so thanks for completing the loop. I want to thank you and Barbara Coles for the lovely and eloquent review of “In the Evil Day” that appears in the current issue [November 2015] of NH Magazine. Please let Barbara know how much I appreciate her sympathetic reading. And I appreciate now you’re choosing a review rather than an excerpt. I find that reviews are really tough to come by for these small-press productions. The book got a great pre-pub review in Booklist, and a nice little blurb in the Valley News, and nothing else until this. So a review, being such a hen’s tooth, probably helps more. Hope the piece goes online and sharable soon. Wonderful Fred Marple piece to close it out. Nice issue, and thanks again. Sight was hiding on page 38 in the PigTale restaurant story. PigTale looks like a great pizza spot and since I’m in the Nashua area fairly often these days, I’m planning on giving it a try. This month’s prize for the Newt search is a wonderful one. Peterboro Basket Company makes the best. I have one that is in constant use as a catalog dumping place and has been since 1994. I love it! 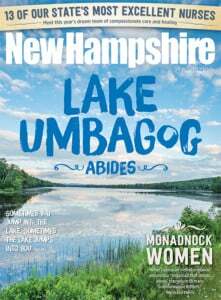 One of my favorite aspects of NH Magazine is its numerous short articles. Retro, Blips, Last Laugh (loved “Woodpile Maintenance”), Weekender and all the others make for quick but interesting reads when little bits of time are all I have. “UpFront” about merino sheep was especially interesting to me as I have a dear friend who raises sheep (not merinos, however) in Lisbon. Several times I have helped with the shearing; fun but hard work. My friend has her fleeces cleaned and dyed, then spins the roving into yarn and knits lovely hats, scarves and all manner of useful and decorative things. Once again an interesting and enjoyable issue. I really enjoyed your 2015 “Ultimate Beer Guide” issue [October 2015]. I love reading about NH people doing great things! I would recommend that you folks check out Great Rhythm Brewing Co. based out of Portsmouth. I am a devout wine drinker, but after tasting this beer ­I got really excited to explore and expand my beer palate. The owners are also extremely cool, down-to-earth and passionate about their product. Keep up the great work on the magazine. I love your magazine. The recent issue [“Ultimate Beer Guide,” October 2015] had great features and stories. As a new resident to New Hampshire your periodical is a refreshing look into the happenings and services of New Hampshire. I would like an in-depth examination by your magazine of customer service — from the customers’ perspective. As I stated, I am a new resident to New Hampshire and as such I am mystified why customer service is so poor in New Hampshire. It is as if business owners and their staff have a profound chip on their shoulders and because I walk into their business I am entitled to be within their business and presence and thereby be dismissed or ignored. Sincere and pleasant salutations are lacking and a genuine thank-you for my business is also a foreign notion and expression. I am of the opinion and experience that the opposite should be true. Second, as a former state police officer (in a western state), it is appalling the lack of regard for laws — traffic laws in particular. It is a wonder there are not more accidents with the total lack of respect of other drivers I observe every time I drive. Incredible is the only word I can think of. Persons passing on the right, crossing solid lines, running red lights, failing to yield the right-of-way and etc. Perhaps an examination of these issues would be worthy of examination and the populace might be enlightened and appreciative. Finally, do you offer, or will you offer soon, a Kindle version so that I might subscribe? Editor’s Note: Our responsive website has most of the content of our magazine in a format that can be viewed on all platforms. At the moment there are no plans for a Kindle version, but thanks for your interest. I can’t wait to try the holiday cranberry relish recipe. Sounds and looks yummy. Great to see so many of the attorneys in the law firm that I worked in for over 30 years continue to be Best Lawyers in our State. Congratulations to all.